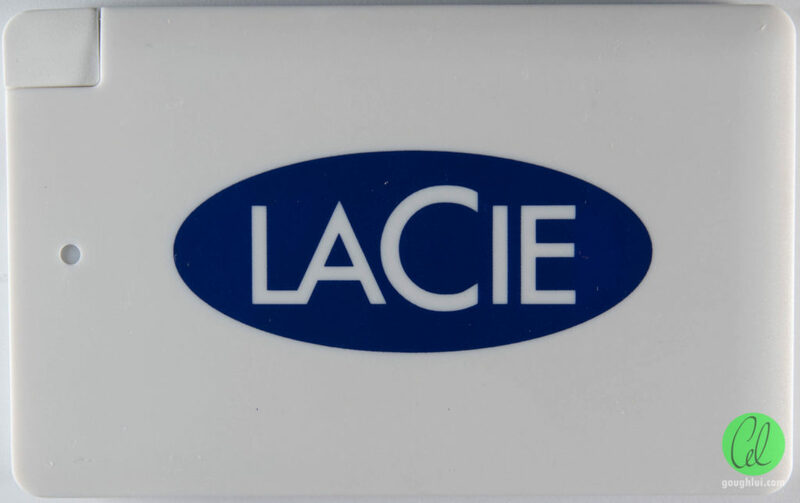 Earlier this year, I attended the SMPTE exhibition and was lucky enough to receive a power bank as part of the bag of goodies that I snagged, thanks to LaCie and Silicon Memory Technologies. As a result, I thought I’d give it a thorough test just to see what it’s like inside. 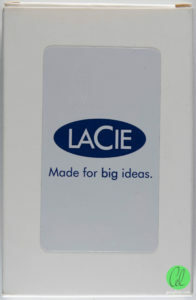 Before I begin, for all avoidance of doubt, LaCie does not make this power bank as far as I can tell. 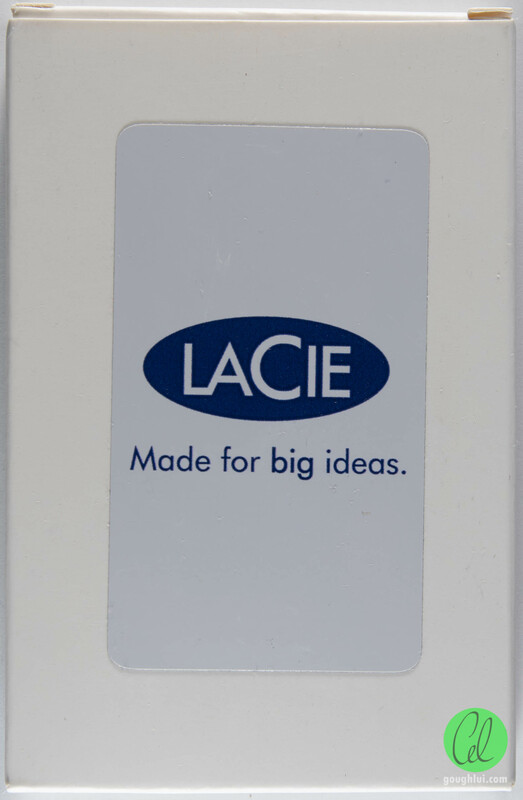 It is merely a promotional item that is used to promote the brand, and doesn’t reflect the quality of the products in LaCie’s range. 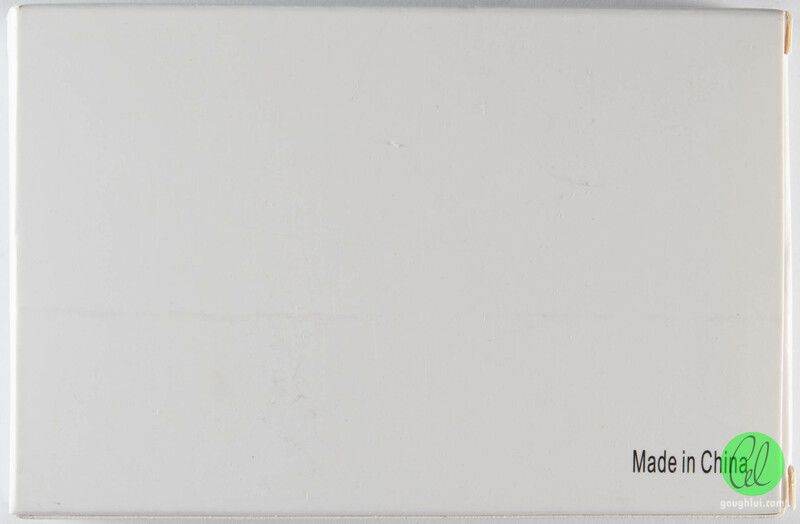 The power bank is packaged in a white matte finish cardboard box with an off-white LaCie sticker on the front. 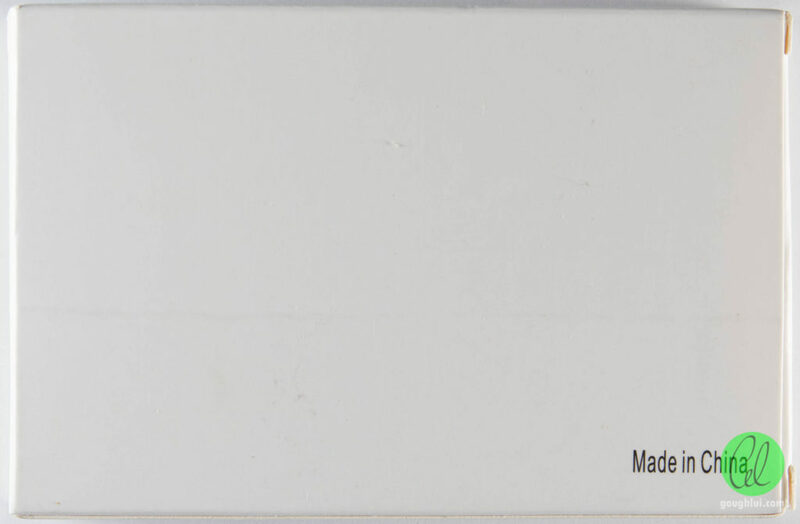 All other sides of the box are blank, with the exception of the rear, which states that it was Made in China. Inside the box, there is an instruction leaflet. 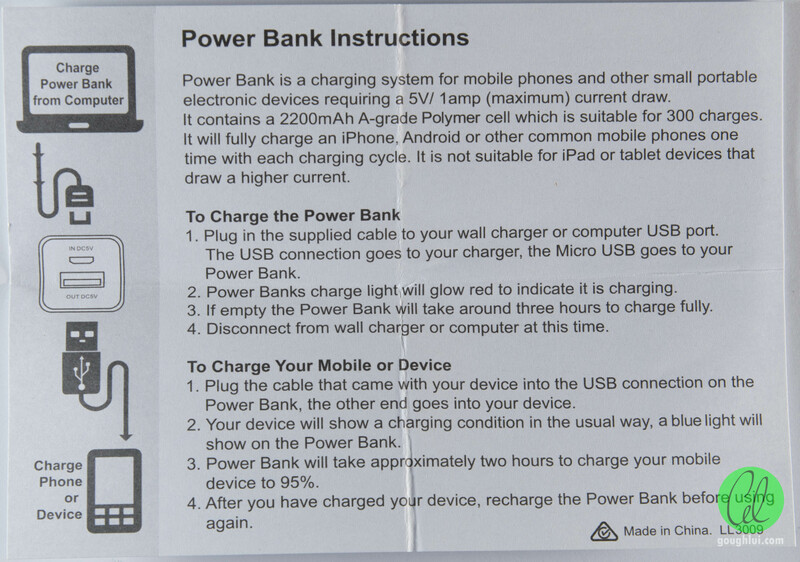 This leaflet seems to imply the unit is good for a 5V 1A output for 300 cycles, and contains a 2200mAh “A-grade” Li-Poly cell which is enough to charge a device once. It claims to be unsuitable for tablets (which is sensible advice to give). 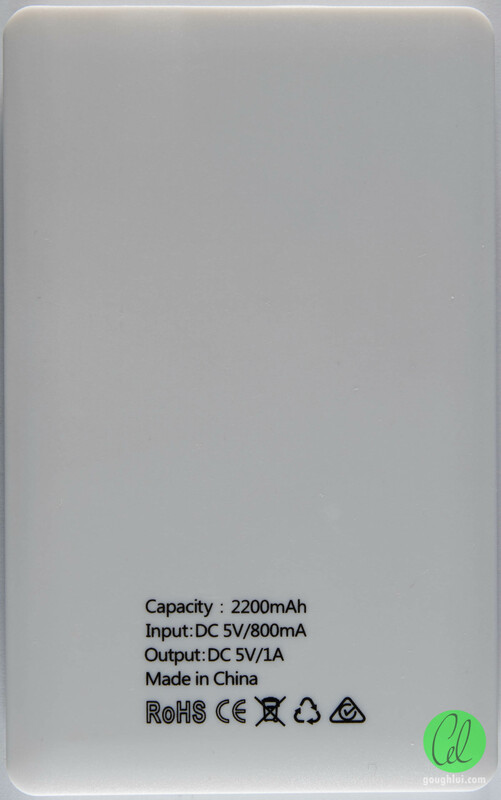 Unlike most other power banks, the leaflet is marked with the Australian Regulatory Compliance Mark (RCM) that means it meets our standards. The body of the unit has a roughly-credit-card sized footprint. The unit is about as thick as a regular 2.5″ laptop hard drive. The whole unit forms a neat rounded rectangle, with a status indication LED window in the middle left. The branding is printed in the center, with the output available at the top left. The rear of the unit is not particularly exciting, but it does give the specs again – namely 2200mAh capacity, 5V 800mA input and 1A output. The Australian RCM makes an appearance again, along with a recycle logo (which seems a little strange). Charging is through a microUSB-B port on one side of the device. Output is through a flat-flexible cable terminated with a microUSB-B connector. An Apple Lightning adapter is also included which tucks into a small hole, although whether this actually works with the most recent iOS was not tested. The unit is held together with no screws, and merely clips together. Unclipping the two halves is almost certainly going to result in breakage of clips, so is not advised. The cell is not marked on this side. 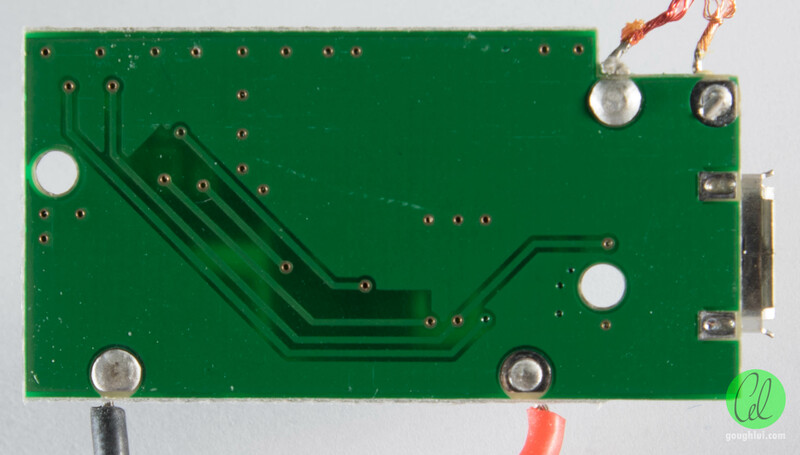 The power conversion PCB takes only a small space in the top corner, and is free of components on its rear. 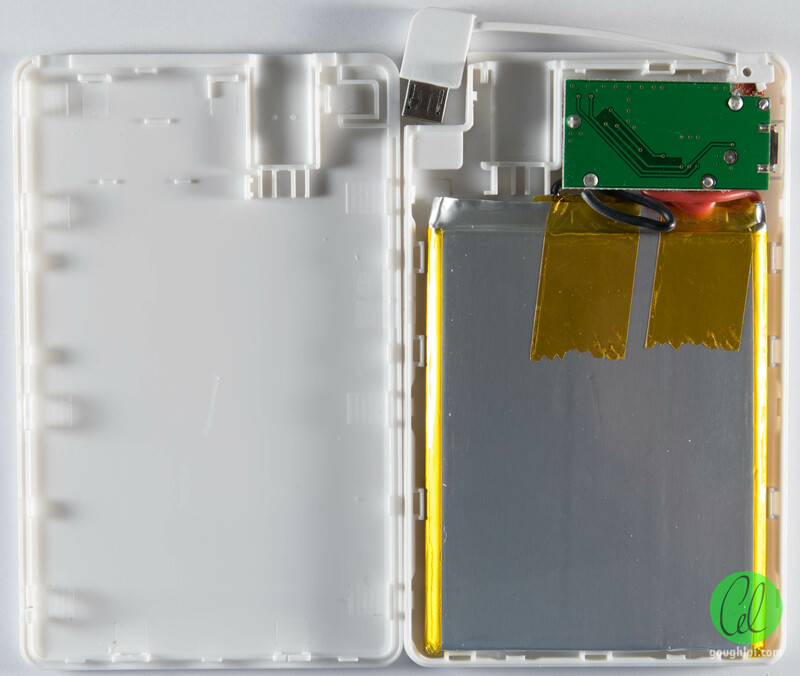 The top side of its PCB shows just how few components are involved in making a power bank. This one uses a DW01A with an 8205S MOSFET to form the Li-Poly protection circuit. 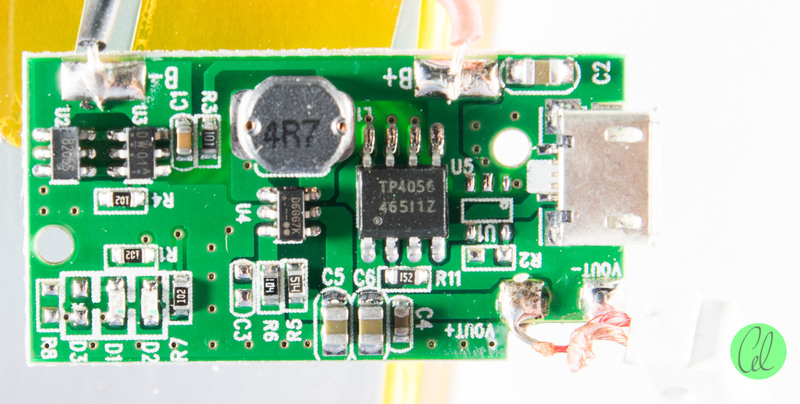 A TP4056 linear Li-Ion charger is used to charge the battery, whereas the D6GG7K is an integrated switching converter that provides the output using an unshielded 4.7uH inductor and a few ceramic capacitors. Two LEDs are used to provide indication. This is very much a cost-optimized design, and in fact, is very similar in principle to the other “free” power bank I received in Korea. The rear seems only to have a few interconnecting traces, otherwise, is completely ground plane. If they could get rid of it, maybe they could have gone for an even cheaper single-sided board! Looking towards the output, we can see that the data pins on the USB side are unconnected – not even soldered for mechanical support, probably to save a little money and avoid shorts. The output, however, is concerning. The wire used is “headphone style” enameled copper which is tinned at the ends. The length of the tinned segments makes shorting a possibility if the wire is not assembled quite right into the casing (as it is a tight squeeze). Because of the squeeze, the copper colour wires have been wrapped into a very contorted mess, and some strands (not visible in this image) are broken and “free”. Should those make contact with any of the others, then a short circuit could result producing some heat (current limited by the converter) which might end badly depending on the duration and resistance of the short. Not the best sort of construction – some sort of heatshrinking would be a good idea. This unit has a bit of a strange quirk. As it seems the blue activity LED is driven by the boost converter, it lights up very dimly in brief pulses when no load is present. The duty of the pulses vary depending on the load, and attempting to measure the LED pulses even with an oscilloscope probe at 10Mohms resulted in some variations. It seems that the LED pulses are about 25% on time at a rate of about 500khz, implying that the converter is basically running all the time, relying on the capacitors and other components to have such low leakage (and the converter to have such low quiescent current) that the unit doesn’t self-discharge too quickly. While it simplifies the design somewhat, it’s also somewhat inefficient. As for the claim of an “A-grade” cell, I’m not so sure. This cell manufacturer really wants to stay anonymous and most A-grade cell manufacturers don’t. 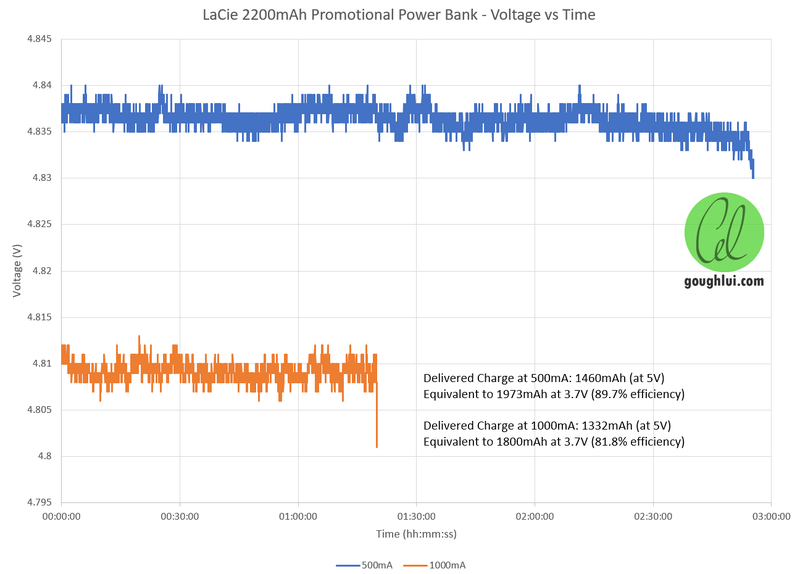 As the unit didn’t claim to be able to do more than 1A, I only tested the discharge characteristics at 500mA and 1A using the B&K Precision 8600 DC Electronic Load. At the 500mA rate, it could deliver 1460mAh at 5V or about 1973mAh at 3.7V implying 89.7% efficiency if the cell was truly 2200mAh. At 1A, this fell to 1332mAh at 5V or about 1800mAh at 3.7V for an 81.8% efficiency. The voltage remained relatively stable, although on the lower side of the allowable USB voltage. This can act as a “signal” to loads not to draw excessive currents, but will also decrease charging speeds in some circumstances. Cut-off occurred at the end of discharge, protecting the cell from over-discharge. 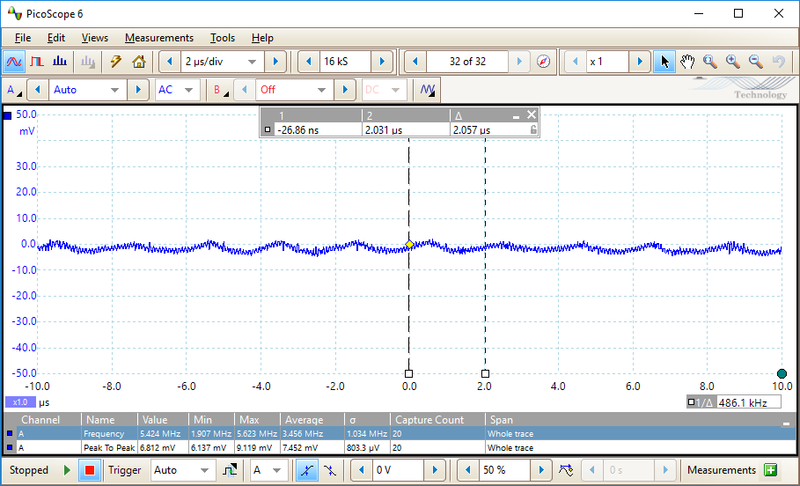 At 500mA, the ripple was averaging just 7.452mV peak-to-peak on the Picoscope 2205A, which is exemplary performance. The larger ripple component was at 486khz, although it seems there may have been a much higher frequency ripple component which would make sense as higher frequencies generally minimizes the converter and capacitor size, at the expense of higher inductor losses. At 1A, the ripple was averaging 12.08mV peak-to-peak, an excellent value. The frequency was about 528khz, although again, a higher frequency component can be seen. 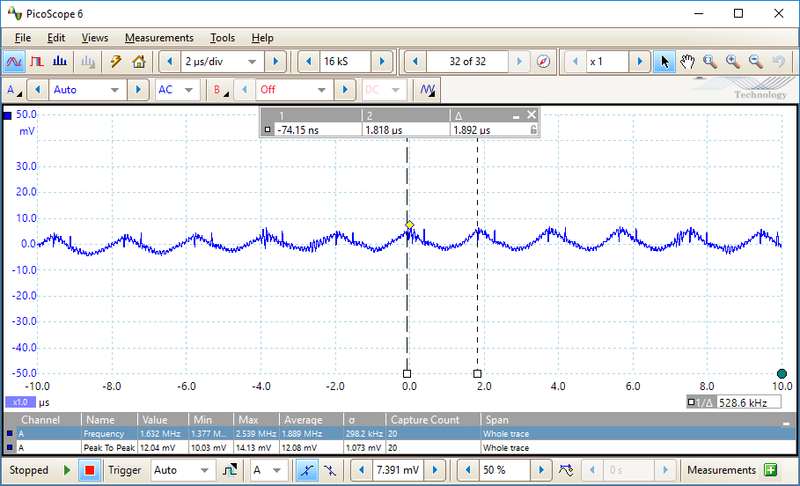 As promised, the charge current (as measured by a Keysight U1461A connected to a modified Charger Doctor) was just shy of the claimed 800mA at 782mA. This fell as charging progressed, as per the standard “linear” charging IC characteristic. Charging took about 3 hours and 23 minutes, delivering 2045mAh. This is close to the claimed three hour charge. 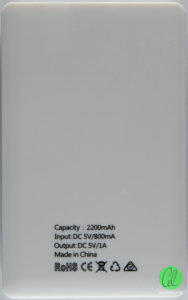 As some of this current is lost to powering the LED, it seems unlikely the cell is 2200mAh, and is probably closer to 2000mAh. The cell voltage was measured on the Keithley Model 2110 5.5 digit multimeter as peaking at 4.23775V. This is a bit higher than the 4.2V termination voltage that a standard battery would expect by 0.8% which may contribute to slightly shortened cycle lifetime, but is within the datasheet claimed accuracy of 1.5%. 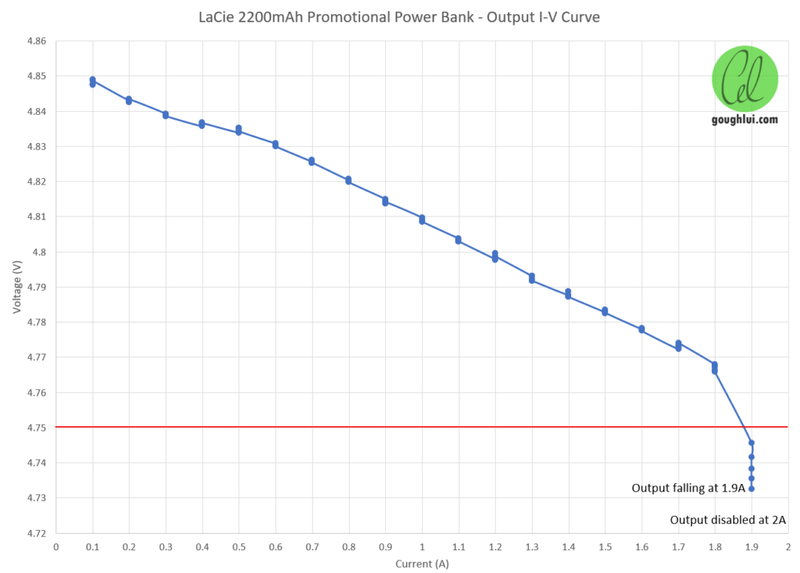 An output I-V curve was developed using the B&K Precision 8600 DC Electronic Load. 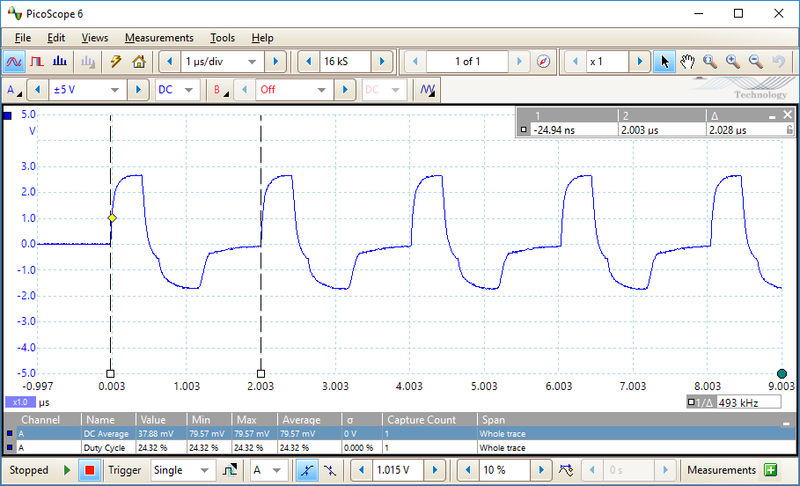 This shows the output with a nearly constant slope as current increased – output was taken via 18AWG wire and crocodile clips at the solder joints, thus lead resistance is much lower than usual, and most of the slope is due to the converter itself. The unit was run open, with five seconds at each current level. The output was falling continually by 1.9A and was completely disabled at 2A. This suggests that the over-current protection may be related to the thermal performance of the converter IC’s over-temperature protection, thus currents of 1.8A may only be possible for short durations. When placed inside the casing, it’s unlikely that it could be sustained, and this may be the underlying reason behind the 1A claimed output current. It is short-circuit protected as a result, and did not suffer any permanent damage from overload. I’m a sucker for free stuff and it’s always great to get some. However, that being said, it still deserves some scrutiny, just to be sure it’s “safe” to use and to learn a little about what it’s made of, how it’s made and how it works. 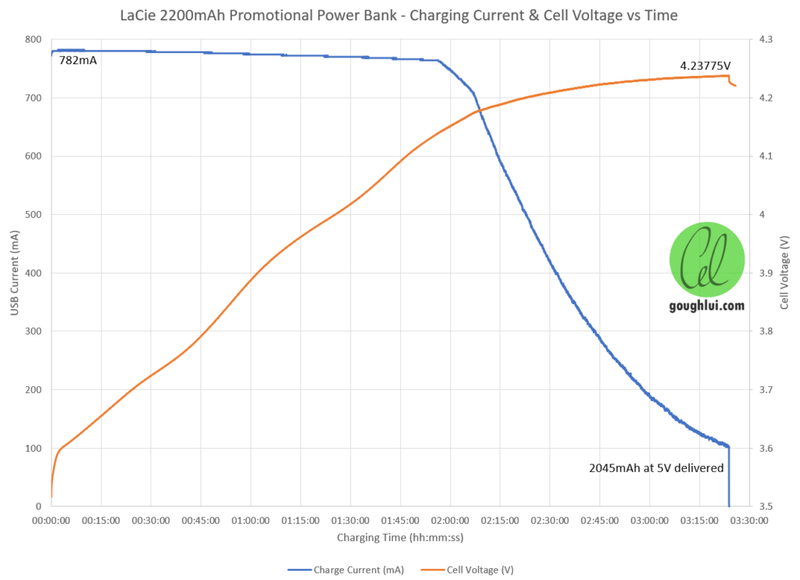 In this case, the power bank pretty much met all of its claims with exemplary ripple performance, with the exception that the capacity is probably closer to 2000mAh rather than 2200mAh. The unit does have some strange behaviour in the sense of the flickering blue LED in idle which probably needlessly increases quiescent current consumption. The use of enameled wire on the output is probably not the best choice either. However, at the low-costs such an item has to target, it’s not a bad effort at all and definitely something people might get some use out of. Thanks LaCie! P.S. You might note that the suite of power bank tests are changing gradually with each unit – I hope to further refine this as my suite of equipment improves and other issues become important. 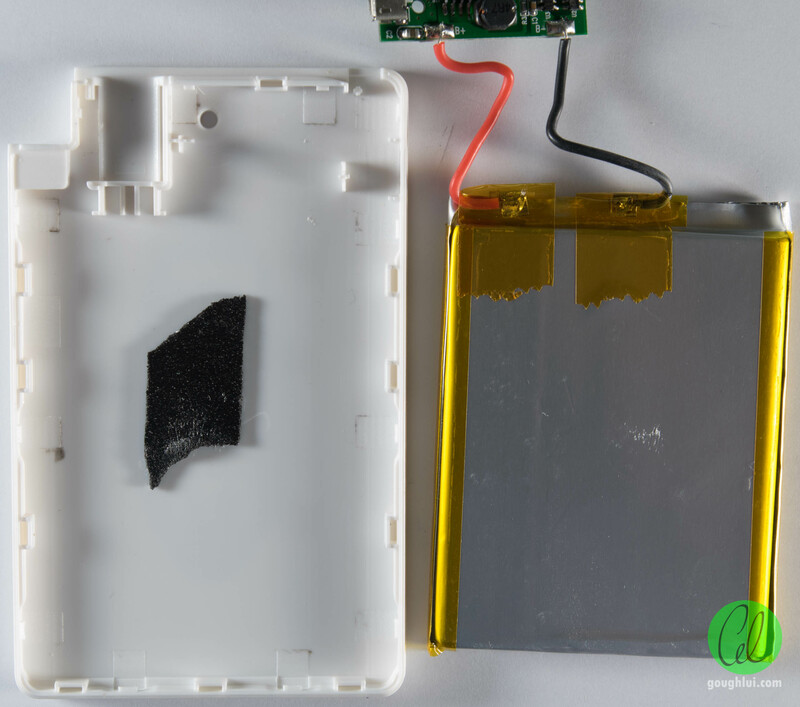 This entry was posted in Electronics, Power Bank and tagged event, mobile, power bank, powerbank, review, tablet, teardown, tested. Bookmark the permalink. I would say the fact that the output wires might short makes this a hazard, not a bargain. Nothing a little heatshrink didn’t fix when I put it back together. That being said … there’s probably a large number of similar ones out there – it’s not a design feature I’m too keen on, but for “giveaway” stuff, every cent counts so it’s probably just one of a number of compromises they ended up with.